Calls resulting in injury from winter time trips, slips and falls are very common at our law firm. We see an increased amount of calls as a result of slipping on snow, ice, black ice, cracked pavement, slush and general wet conditions around the winter time. And for good reason. The weather in such places as Toronto, London and Peterborough is frankly quite bad, and puts everyone at greater risk of injury. If you were living in a warm climate, you wouldn’t have to worry about any of the winter hazards which Ontarians encouter every day having to endure our harsh winters. My parents would tell me that we have it good compared to the cold, ice and snow which they experienced in early Toronto. It’s a fact that our winters are less harsh then the winters which we presently experience; but I will have to leave that explanation to a climatologist from Environment Canada. Quick injury lawyer factoid: Did you know that you can check the amount of snow fall/precipiation using the Environment Canada website? This is a handy tool for any winter time slip and fall claim in order to establish how much snow was on the ground the day of; or the days leading up to the accident. If one of our clients slipped and fell on a large patch of ice, we can tell from the Environment Canada website whether or not the property had been maintained based on the weather and precipitation/snow patterns. 1. Wear proper winter foortwear. We live in Ontario. The winters are cold and icey. Invest in a good pair or winter boots. You’d be amazed the amount of clients we meet, particularly Toronto clients who don’t own winter boots! Our London and Peterborough clients tend to own winter boots, but I can’t say the same thing for our Toronto clients. 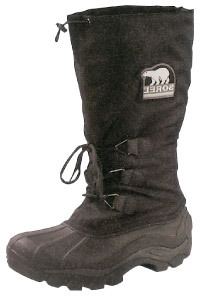 If you wear winter boots, the will provide you with the grip you need to combat those icy and snowy conditions. On top of that, winter boots provide excellent ankle support to prevent ankle fractures, or other orthopaedic injuries. Winter boots aren’t just for kids! Adults can wear them too and it’s a wise idea to do so in order to prevent a slip and fall injury. 2. Slow down! There’s no reason to walk quickly and risk your injury. I know that it’s cold outside, but old is temporary. A broken ankle or broken wrist as a result of a winter time slip and fall may leave permanent injury and long lasting pain and suffering. Slow down your walkiing pace and watch where you’re going. 3. Pay attention to where you’re stepping/walking One of the biggest reasons for slip and fall injuries is because clients don’t pay attention to where they’re walking or stepping. We can always blame the Defendant property owner if s/he failed to clear their ice or maintain their property in a proper state of repair. But even if that’s the case, nobody is forcing you to walk where you’re walking. If it looks dangerous, don’t go there. Take a longer route if necessary to avoid any potential slipping hazzard. If it looks icy, it probably is. Take the long way if you can. An extra 30 seconds or 5 mintues is a small price to pay compared to the pain, anguish, embarassement and suffering involved in a serious slip and fall injury. 4. Dress warm I know what you’re saying: Brian; how can dressing warmly prevent my slip and fall accident? Good question. If you dress warm, you will feel more comfortable and less stressed in the cold. If you’re more comfortable, you’ll be less likely to rush your movements and act in a haste. If you’re freezing cold, you will take that shortcut over the patch of ice, and probably rush across the ice because you’re so cold. But if you dress warmly, you will be more likely not to take any shortcuts or put your health in danger on account of feeling cold. On top of that, you might actually find yourself enjoying the winter instead of loathing it. Did I mention that winter fasions are all the rage? 5. Be a good neighbour: Sand, Salt and Clear your Snow The most common place for a slip and fall accident is in the 100 meter radius outside of your own home or property. People injure themselves all of the time on their own property, or on the propery of their neighbours. If we were all nice neighbours and cleared our ice, laid down salt and sand, we would reduce the chance for slip and fall hazards for ourselves, our families, our neighbours and even the mail man. Some people want to hurt their mail man, but I don’t. If you happen to sustain a winter time slip and fall accident, remember to take photos of the area where you slipped and fell. This is very important and will go a long way towards establishing liability against the at fault party/property owner. This is one of the most important things in any slip and fall case. Use the camera on your cell phone if you don’t have a proper camera handy to take a photo. In addition, you should also gather the names and contact information of any witnesses who saw your accident. These people will provide helpful information to our lawyers in order to better understand how your accident happened. A judge, jury and the insurance company will also want to know about these witnesses. It will only help your case (unless the witnesses don’t like you and go on record saying that the accident was entirely your fault). Anyone else notice how well Toronto’s professional basketball team is doing? A 4 game winning streak heading in to the all star break? Somebody pinch me! That new player we acquired in the trade is the ultimate closer. Toronto hasn’t seen a player of his ilk since a guy named Carter graced our floor. I can’t wait to see what he does next! The law firm of Goldfinger Injury Lawyers has offices in Toronto, London and Peterorough. We represent accident victims all over Ontario. We have been representing winter slip and fall accident victims for years and have helped them win countless cases both inside and outside of the courtroom, resultting in recovery for our clients in the millions of dollars. If you’ve been involved in an accident, contact our law firm toll free at 1-877-730-1777 or by email at info@goldfingerlaw.com. All of our consultations are free, and we it’s our firm policy not to charge any legal fees until your case settles. We would be pleased to assist you as best as we can with your legal matter.